603 Painting specializes in residential and commercial painting in central and southern New Hampshire. Our motto, We Aim To Please, is not just a catch phrase! We provide quality workmanship, honesty, accurate free estimates, and hold customer satisfaction to the highest standards. We are experienced to do work on any project from residential, restoration, fire and water damage, to commercial and industrial projects. One of the easiest and most effective ways to clean a dirty house is by using a power (or pressure) washer, however, without proper care, you could easily do more harm than good. 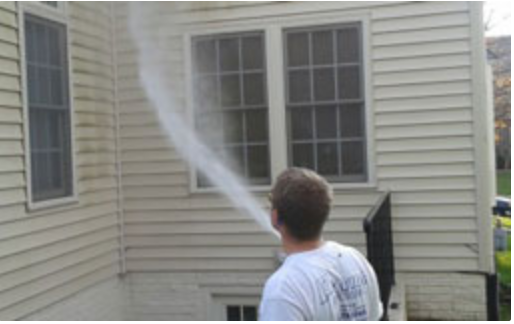 The typical power washer can produce enough pressure to strip the siding of paint as well as dirt. If your paint is older and already in a run-down condition power washing may not be the best choice unless you are planning on having your house repainted anyway. And, if that’s the case, why not just call 603 Painting? Power washing, as a cleaning method, has become one of the more popular means of cleaning everything from boats to ATVs to houses. By following these few simple pressure washing tips you will handle your cleaning job efficiently and safely. 1Choosing the correct nozzles and/or tips . To use a pressure washer effectively you need to choose the correct nozzle and/or tip. The majority of pressure washers come with interchangeable spray tips that serve two purposes. One is to lower the pressure and draw the detergent; and the other is for high pressure rinse at the different spray angles. Most Pressure washers come with several color-coded tips/nozzles that vary from by degrees of angle. As a general rule the smallest angle delivers the most powerful spray and is the one you should be most cautious with. For example, if you want to remove a stubborn smudge from you driveway you will use a 0 degree angle. However, if you want to move debris (such as leaves, sand, etc.) away from your house you will use a wider angle such as 25 or 45 degree nozzle. Caution: be sure the nozzle/tip is completely and firmly attached to the spray handle before using. Failure to do so may result in the tip becoming a projectile that may be lost or do damage to the property and/or cause injury. 2Using chemicals. Only use chemicals and cleaning solutions that are approved for the brand and model of pressure washer you are using. Many pressure washers come with detergent injectors that allow for continuous, uninterrupted flow of the cleaning solution into the spray stream. If you use anything other than approved detergents they may not be environmentally friendly and they may be harmful to pressure washer components and to humans. Be aware that a solution that works well for concrete might be harmful to wood. Always test a cleaning solution in an area that is not visible before cleaning your entire house. 3Testing the power. Test the power of your pressure washer before you get too far into the job. It is best to start spraying few feet away from any object and slowly bring your wand to within 3 to 4 feet of the surface you want to clean. Move your wand side-to-side a couple of times and check to see if the surface is getting cleaned to your expectation. If additional cleaning is needed, move your wand gradually closer to the surface (approximately 1 to 2 feet). The reason for the gradual cleaning is because pressure washers are extremely powerful and if you start too close you could damage the object instead of cleaning it. 4Plan Ahead. Be careful when spraying around windows, mail boxes, flowers, vents, eaves, or light fixtures. They can break or become damaged if the pressure washer spray is aimed directly at them. In addition, keep the spray gun pointed downwards so that you don’t spray under the siding. This will prevent the siding from being ripped from your house. It will also prevent water from being forced up and under the siding where it might sit for days before drying. Be careful when cleaning the edges around windows and doors. It’s always a good idea to check for any holes or damaged caulking before you start the cleaning process. Repair any that you find with a good commercial grade caulking compound designed for outdoor use. Follow all manufacturers recommendations for drying and curing time before you try to clean the areas you just caulked. After all, you don’t want to blast away the brand new caulking you just spent 8 hours applying. 5Pressure Washing is similar to painting. If you’re not careful you may start spraying everything and everywhere. Avoid random spraying patterns. Like painting, start in a location and progress outward in a controlled and orderly pattern. This will help you avoid wasting you time having to clean the same area two and three times. Spray horizontally with smooth left to right movements. In one stroke try to cover a 3 to 4 foot wide area. To prevent streaking, start from the top and work your way toward the bottom. We hope you found these power washing tips useful.